Look for Good Reviews & Customer Feedback: Maid Complete offers customer testimonials on its website at maidcomplete.com, but looking at a company's website isn't the only place to learn about their service. Check local blog postings, Facebook and even your area Better Business Bureau to see if any complaints have been filed on specific agencies. Ask for Referrals (and check them out): Most companies have a list of referrals that they hand out to potential customers. While these types of referrals can be a good start, be sure to ask friends, family and neighbors for their own personal recommendations. Remember, a company is not going to give you a referral to someone who didn't like their service, so ask around on your own to see what cleaning companies others like (and dislike). Ask for a walk-through of your home. While Maid Complete offers a set price to clean a certain number of rooms, other companies charge extra fees for specific jobs like dusting; scrubbing tiles, etc. 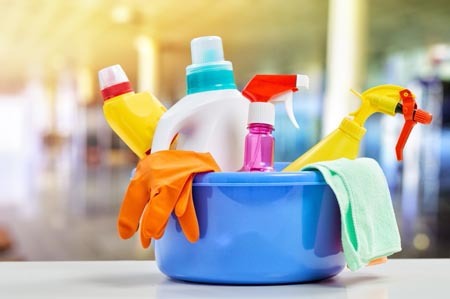 To be sure that you are hiring the right housekeeping service in Phoenix, ask for a walk through where the service provider will explain in detail what services are offered in each room. If you need a specific task completed, you can negotiate the cost before any cleaning specialist walks through your door. Get a detailed contract: It can be difficult to hand over cleaning control of your home. When you do, the odds are you aren't exactly sure what needs to be done. Few of us ever sit down and list all of the chores we handle on a daily or weekly basis. That is why it is a good idea to have your cleaning service list every task to be done during their visit. Many even offer a detailed checklist which is filled in and left when they leave. That way there is never any questions about whether or not a project is included in your service or not. Plus, when both the provider and client know expectations upfront, both can feel satisfied that the job was completed properly. Ask about insurance and bonding: The fact is that accidents do happen. It is not common; but it happens. Cleaning specialists accidentally spill cleaners that may damage a surface or they may slip and fall while working. No matter what type of accident occurs, you want to be sure that you are covered. Consider this: if your housekeeping service does not have proper insurance, you may have to cover the cost either out of pocket or through your homeowners' policy. Both can be expensive. Being sure that your service provider is properly bonded for the Phoenix area is also important; just in case of theft. Check licenses and certifications: different areas require different types of licensing to provide their services. Check with your local municipality to see what certifications and licenses are needed in your area and check to be sure that your provider has them. Otherwise, you could be subject to a hefty fine for hiring the wrong house cleaners. Hiring a housekeeping service can offer you the freedom to enjoy your home without the stress of keeping it clean. By following the tips described above you can rest assured that any provider you choose will be able to offer you the professional, safe and complete work you expect. Maid Complete is a full-service housekeeping service in the Phoenix area that can handle all of your cleaning needs.